Is Ben Scrivens a Significant Upgrade Over Devan Dubnyk? Edmonton Oilers: How Big an Upgrade is Ben Scrivens? Edmonton Oilers GM Craig MacTavish said he was looking to upgrade his goaltending and once again has made a deal in that area in acquiring Ben Scrivens. He has swapped out former starter Devan Dubnyk to the Nashville Predators for forward Matt Hendricks and replaced him with former LA Kings’ goaltender Scrivens, who was acquired for a 3rd round draft pick. MacTavish has made no secret he wants better goaltending. He was trying hard in the offseason to get Cory Schneider among others, and most recently brought in Ilya Bryzgalov, to mixed reviews. 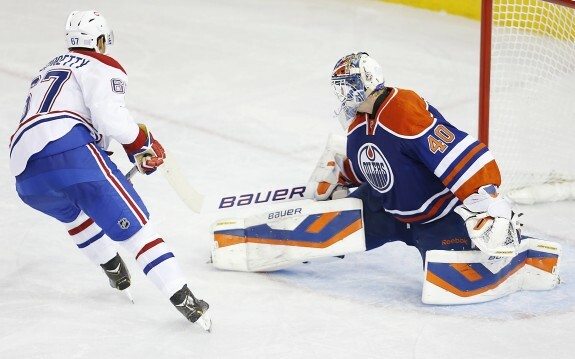 Scrivens is the latest addition that he hopes will be an upgrade for the Oilers. If the comparison is based on this season, it is no comparison at all. Dubnyk’s numbers are dreadful, whereas Scriven’s are exceptional. If the numbers continue to trend that way, then certainly MacTavish will have made his best deal in his young tenure as Oilers GM. Those numbers only tell part of the story and are a small sample size. You also have to factor in Dubnyk playing in front of a last place team where Scrivens is in front of a strong Kings defence. If you compare career numbers, there is still a gap, but they are not so drastically different. Both are 27 years old and both are goaltenders who are trying to prove they can be legitimate No. 1 goaltenders in the league. Dubnyk has the longer track record and NHL experience, but Scrivens is the one who is trending upward and caught the league’s attention this season. The other thing the two goaltenders have in common is that they are pending UFA’s. In that sense, obtaining Scrivens is a low risk move for MacTavish. Both goaltenders on the Oilers roster prior to the deal, Dubnyk and Bryzgalov, were UFA’s, so swapping Scrivens for Dubnyk does not affect their financial situation much for this season. For the cost of a 3rd round draft pick, the Oilers have the rest of the season to determine whether Scrivens is worth signing to a longer term deal. Certainly with his play so far with the Kings he has proven to be able to play at the NHL level and play well. He’s a goaltender that has just 51 NHL appearances to date however, and at 27 years old the Oilers will need to make a decision on whether his play over essentially one full season is enough to make him a part of their long term plans or cut their losses and look elsewhere in free agency. Expect Scrivens’ numbers to come back down to reality a little playing behind the Oilers, but he’ll finally have a chance to prove he can be a No.1 goaltender in the league for a team that desperately needs one. In the short term it’s an upgrade for the Oilers, the numbers alone bear that out. If only for the fact a change of any kind was needed and the struggling Devan Dubyk clearly looked like he would benefit from a change of scenery. Long term there is the potential for it to be a significant upgrade if Scrivens proves to be a capable number one netminder. The verdict on that however, will not be known just yet. It cost them very little from their roster and system, essentially swapping goaltenders and adding Matt Hendricks while giving up a 3rd round pick. Both goaltenders are UFA’s so they are still in the position of having no one signed past this season and a decision needing to be made. Dubnyk was looking more and more like he wasn’t part of the future plans, now the Oilers have just given themselves another option to consider over the next four months.